Customer Loyalty is Priceless. Earn it with VETport. Customer loyalty programs are the talk of the town these days. You will not have to dig deep in order to find businesses which have incorporated a loyalty program. Coffee shops were first to come up with the concept of a customer loyalty program. These days the concept finds relevance in many other industries such as airlines, and also human healthcare. Now, the question you need to ask yourself is whether the concept finds relevance in veterinary practices as well? Here’s is what will help you in finding the answer. What does one mean by customer loyalty? Customer loyalty is something which stems out of a positive emotional experience, mainly a physical attribute satisfaction associated with a product or service. As of late, acquiring new customers for your veterinary practice is simple, but retaining the old ones is what demands attention. Customer loyalty programs enable you to retain your old customers in a cost-effective manner. When you have loyal customers, you do not have to think too much about the high advertising costs of your veterinary clinic or hospital. All effective vet practices should be focussed on two important things: getting new customers on board and retaining old ones. Do you think customer loyalty is something that is of prior importance for your veterinary clinics? It’s time you start looking out for ways to keep your existing customers happy instead of getting new customers on board on a daily basis. Now.. You may ask your yourself the question - Why does customer loyalty matter? Customer loyalty matters because it is the true indicator of the future prospects of your business. It means that your customers are not only satisfied with your product or service, but they also want to do business with you in the future. If you have a veterinary clinic or hospital, you know that your revenue is directly proportional to the number of clients you have. Don’t you? Let’s think of it in this manner - You think of getting a new client for your veterinary clinic. The process obviously entails a lot of labour since your first impression is the last impression you give a client. Now, let’s look at the other situation you have to face. You already have a client on board. It implies you’ve had multiple conversations with the client and have already reached a level of comfort. In order for your veterinary business to function to it's optimum, it is essential for it use marketing tools which address customer retention queries in an effective manner. Loyalty programs are great for the same. Now that you are aware of the fact that retaining your old customers is essential, here’s what you need to know. What are the factors influencing the loyalty of veterinary customers? Do you wish to increase the loyalty amongst your customers so that they keep coming back to get your services? Keep the following in mind. #1 Your first impression matters a lot! People often tend to make a judgment about you upon meeting you for the very first time. When it comes to veterinary clinics, individuals start feeling connected with your clinic upon the first visit itself. It is essential to keep a warm and inviting environment for the patients and their owners when they visit you for the first time. Why does this matter? So that they keep coming back to you! #2 Do you see yourself as pet friendly? It is an obvious fact that pet owners care extensively about their pets. If you wish to retain customers at your veterinary clinic, it is important for you to treat their pets like your family members. This gives the owners a sense of satisfaction that their furry babies are in safe hands. #3 Is your business transparent enough? At times, your clients might feel that they are being swindled. In order to avoid this, it is essential for you to have clear cut transparent processes at your veterinary clinic or hospital. They should never feel that you are overcharging them for unnecessary tests or medications. When your customers are satisfied with the services that you offer them, it not only helps you to build a strong client base but also gives you several references for your business. What do you need to do to get customer loyalty at your veterinary practice? Veterinary healthcare services as of late are filled with a lot of hustle-bustle. With so many patients visiting you in a day, it is often not possible to keep a tab of all their needs. Some may need a specific kind of treatment, while others may not. Understanding the specific requirement of each client is what drives customer satisfaction. You can create a questionnaire to understand the needs of your clients in a better manner. An effective way to make sure that your customers visit you, again and again, is by giving them rewards. This will make them feel appreciated and in turn make their visits more frequent. A good veterinary software service provider will equip you with multiple reward programs that will help you in retaining your client base. When it comes to healthcare services, time is equivalent to money. At a veterinary clinic or hospital, each owner wants their pet to get better as soon as possible. In order to do this, they will do anything and everything. If you want customer loyalty at your veterinary clinic or hospital, do give their time the top priority. Be quick and efficient in your services. Now, you may ask yourself - What will you reap out of customer loyalty? 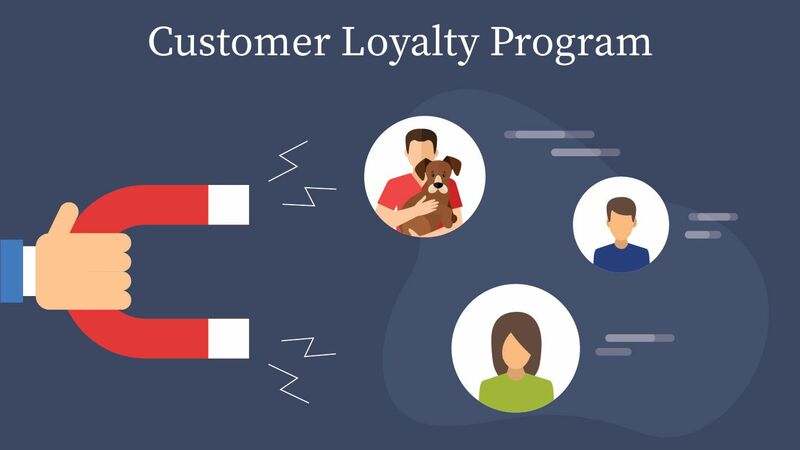 Here goes the rundown of benefits given by customer loyalty programs. If your veterinary clinic or hospital has many satisfied clients, it will not just help in maintaining consistency but also give you increased revenue. Accruing new clients is a painstaking process and needs a lot of labour. In comparison, client retention through the help of customer loyalty programs is relatively easier and does not require a lot of financial resources. A happy customer is key to good business. Customer loyalty programs will give your clients the utmost satisfaction and will ensure that they visit you again and again. When you deep dive into a clients needs and wants you start understanding the client in a better manner. By repeating the process with multiple clients you can form inferences about a customer’s preference and start thinking of ways to give them the same. Walt Disney once remarked, "Do what you do so well that they will want to see it again and bring their friends." This fits in aptly when it comes to customer loyalty at your veterinary clinic. You need a happy customer for a prosperous business. Choosing VETport’s Customer Loyalty Program will make sure that your customer visits you again and again. Sounds interesting? To learn more, click here!